Today we released a preview of our AWS Toolkit for Visual Studio that includes support for the release candidate (RC) version of Visual Studio 2017. Because this Visual Studio release contains some significant changes for extension developers, we’re making this preview available in advance of the formal release. We highly encourage you to pass along feedback about any issues you find or whether you were successful using the preview by adding to the GitHub issue we describe below. Visual Studio 2017 also contains support for the new MSBuild project system for .NET Core projects. With this preview of the toolkit, we’ve updated the .NET Core Lambda support to use the new build system. For existing Lambda projects based on the Visual Studio 2015 project.json-based build system, Visual Studio 2017 offers to migrate them to the new build system when you open the projects. The AWS Toolkit for Visual Studio contains MSBuild target files for AWS CloudFormation projects. In previous releases of Visual Studio, you had to install these files and dependencies for an extension outside of the Visual Studio folder hierarchy. This required us to use a Windows Installer to install the toolkit. Starting with Visual Studio 2017, these MSBuild extensions exist within the Visual Studio folder hierarchy and can be installed from the VSIX extension package without an installer. As the installer technology we use doesn’t yet support Visual Studio 2017, we’ve decided to distribute the preview as a VSIX file only. Double-click the VSIX file. This launches the VSIX Installer process, as shown. After the installer finishes, the toolkit functions as it has in previous versions of Visual Studio. 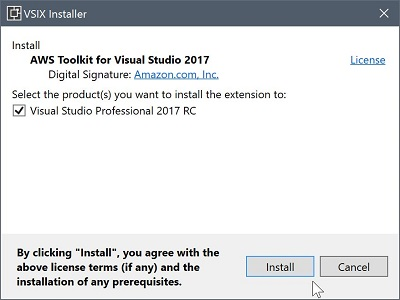 To track issues with installing and using the toolkit in Visual Studio 2017, we opened the following GitHub issue in our AWS SDK for .NET repository. For any issues or comments about our Visual Studio 2017 support, please add to the issue. Also, by letting us know if everything is working as you expected, you help us evaluate the readiness of our support for Visual Studio 2017.